You’ll just have to put one of these tools in your hands to appreciate how comfortable and well-made they are. Designed and produced by Radius Garden, these unusual looking tools use the latest research into human factors and tool usage to maximize your power while minimizing hand and wrist stress. Pick up one of their small hand tools—trowel, cultivator or weeder—and you will be ready to throw your old hand tools away. The curved grip is ergonomically designed to reduce stress on your wrist, and the aluminum-magnesium blades are lightweight and strong. The larger tools, such as spades and forks, have an O-shaped handle, which, at first sight, seems very odd. However, once you start using them, you realize how often you use two hands on the handle. The O-grip provides four times the gripping surface that the typical D-grip does. The tools have an unbreakable steel shaft, encased in resin, and the blades are stainless steel. 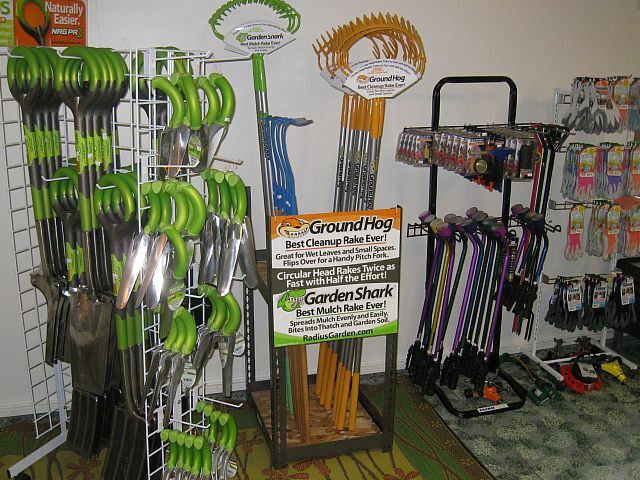 O-grip tools include spades, forks, weeder, edger, and bulb auger. Dramm continues to provide quality, durable and professional watering tools and accessories to nurseries, greenhouses and avid gardens nationwide. Dramm strives to produce products that save time and energy while providing quality products that will last a lifetime. Both our customers and our employees love these Atlas Nitrile coated gloves. They are lightweight but tough, and fit like a second skin. The nylon knit liner is breathable, so that your hands don’t get hot. Throw them in the washing machine when they get dirty. Assorted colors are available for you fashion mavens. The farmers among you will recognize the small head on these hoes as sickle sections from a sickle mower. The small, sharp blade is perfect for working around perennials and shrubs in the garden without damaging the good plants and without bringing too much soil up to the surface. You won’t have much use for bigger, clunkier hoes after using one of these.